Word has been received by Mrs. Hazel Isabella Bowbrick, stating that her husband, Pte. 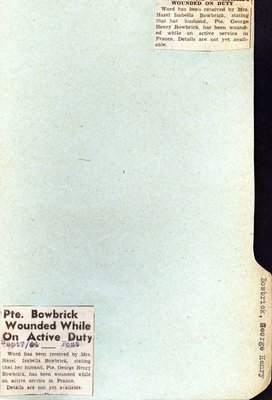 George Henry Bowbrick, has been wounded while on active service in France. Details are not yet available. September 20, 1944 WOUNDED ON DUTY Word has been received by Mrs. Hazel Isabella Bowbrick, stating that her husband, Pte. George Henry Bowbrick, has been wounded while on active service in France. Pte. George Henry Bowbrick of Lindsay, Ontario, paid the supreme sacrifice in World War II. From the list of the Honour Roll of Victoria and Haliburton Counties.